A fourth album of innovative and humorous, light and dark, folk rock songs about life, love and contemporary issues. I'm an economist and a futurist turned singer-songwriter. My four albums have all mixed love songs with songs about modern life and contemporary issues. I'm rather proud of what people have said: "A delicate balance between heart-on-your-sleeve songwriting and playful arrangements"; "Deep thoughtful music still exists and he is a master of it"; "Powerful people should have this on repeat"; "Inspirational music that really speaks to the listener"; "Really funny"; "Epic storyteller with fantastic lead guitar" - which credits the brilliance of guitarist Bruce Knapp - "Full of beautiful music"; "Challenges society’s attitudes". Bruce Knapp's guitars, Richard Sadler's bass, Tony Shepherd's percussion and the stardust backing vocals of Callie Howard make me proud of this fourth album. 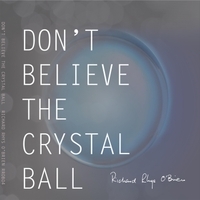 I believe we can make the future, which is behind the title track "Don't believe the crystal ball". The opening track "Heaven for Broken Dreams" reminds us that you don't have to come in first to succeed. "All of Us May Be Wrong" calls for tolerance about beliefs and a little humility about what we think we know in our search for the truth. “Monte or Bust” is just fun, written a few years ago now. "In the Shadow" is filled with the jazz genius of the band. "Darkness Took the Light" is dark but with light at the end of the tunnel. "Trees Are Blue" is fun with a message about how we treat our world. "In the Cool of the Night" is a pure unadulterated love song. "On Your Way" is a love song too, even it may not seem to end that way. And "Sittin' on the Wall", one of the earliest songs I wrote, just wrote itself. Please enjoy it all!! And my website has fun visuals too!